"I wasn't evicted and stayed in the only home my kids ever knew." 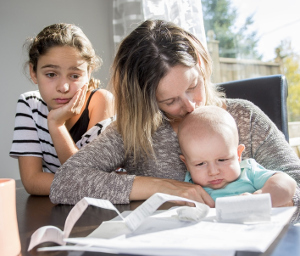 Due to the lack of affordable housing in Fairfax County, many of our neighbors are just a paycheck away from being in serious financial trouble and possibly facing homelessness. Anything from a medical emergency to something as simple as car trouble can set a family back for months. This is why Britepaths offers financial assistance grants to our clients in times of crisis. With the generous donations from our friends in the community, we are able to lend a hand in keeping our clients in their homes and working toward self-sufficiency. Clients are referred to us by social workers at Fairfax County's Coordinated Services Planning (CSP) after completing an intake process and demonstrating that the funds Britepaths provides to the client's landlord, utility or other relevant vendor will help them retain or regain financial stability. Often, the client and other non-profits contribute funds to create a "package" of funds that will pay off the entire bill. "Reliable Rides" is a special segment of our Financial Assistance Program that helps fund major car repairs so that clients in crisis can maintain their cars safely and continue to get to work to support their families. It is one of the few available car repair assistance programs in Fairfax County. Referrals are made to Britepaths by CSP based on demonstrated need and the adherence to specified criteria, and is granted as funds are available. Upon accepting a referral, Britepaths negotiates the repair with a partner car repair service or the service the client has retained. Britepaths pays a portion of the bill (usually up to $400) directly to the service provider with the understanding that the client will also help pay. We ask clients who receive Financial Assistance from us to take a Basic Budgeting class or free Financial Counseling Clinic, or receive Financial Coaching or take a class/workshop at the Financial Empowerment Center at South County to help them get a handle on their finances. Clients who are interested in working more intensively on their budgeting and financial skills may be eligible for one-on-one Financial Mentoring. Thank You to Our Grantors and Partners! These generous local businesses provide discounts and in-kind services to Britepaths and our Reliable Rides clients to help get them back to work! Thank You! Britepaths always receives far more requests for Reliable Rides assistance than we are able to fulfill. You can donate to Reliable Rides via our secure Donate page. Type "Financial Assistance" or “Reliable Rides” in the Comments on the donation form. Companies and organizations wishing to sponsor the program or provide car repair discounts or services, Please contact Diana Vallenilla at 703.273.8829 or dvallenilla@britepaths.org. Need Help? Britepaths requires a referral for this and many of our services. Click Here to learn how to get help.